March brings with it the first day of spring and April seems to have brought that first day where I believe spring could actually be here consistently. I don’t know about you, but boy am I ready for some warmer temperatures!! Naturally, spring is the time of year that we roll up our sleeves and do some of the deep-cleaning we’ve been putting off all winter. Though, for any manufacturer or processor, “spring cleaning” is a year round affair. 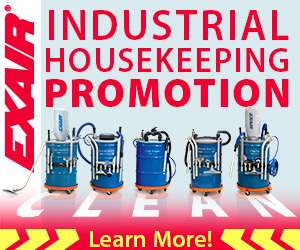 Lucky for you, EXAIR has an entire line of Industrial Housekeeping Products that’ll get your shop tidied up for spring. In this blog, I’d like to dive into the Chip Vac. With its powerful suction, it’s an ideal solution for fast and efficient cleaning. EXAIR’s Chip Vac is a compressed air operated industrial duty vacuum designed specifically for vacuuming up chips and shavings. The powerful vacuum is suitable for use with metal, wood, or plastic chips and is designed to thread into the 2” NPT bung on standard drum lids. The Chip Vac can handle dry or wet chips from fixtures, floors and work surfaces of machining centers, lathes, saws, mills, and a variety of other industrial equipment. 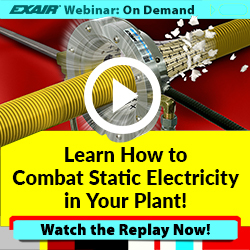 Electrically powered vacuums or shop vacs are not designed to be operated in a rugged industrial environment. Filters clog, motors wear out, and you find yourself frequently replacing them. EXAIR’s Chip Vac has NO moving parts to wear out, doesn’t require maintenance, and needs nothing but a source of compressed air to operate. In addition, the sound level produced is half of that produced by an electric vacuum. The Chip Vac is sold in systems both with and without the drum. EXAIR has 5, 30, 55, and 110 gallon systems available for a wide range of applications. If you already have spare drums in your facility, the Chip Vac is also available with just the lid assembly, Chip Vac, 10’ hose, tools, and filter bag to attach to the top of your own drums. All systems will include a drum lid with a locking ring that easily fits onto the top of a standard open top drum. It’s easy to remove and place onto another drum so that different materials can be easily kept separate for recycling. Recycling companies will pay a premium price for pre-sorted chips and shavings. With the Chip Vac, it’s as easy as removing the lid and placing it onto a new drum in between jobs. Don’t waste your time this spring fooling with and replacing electrical vacuums. Get yourself a vacuum designed for the job. One that’ll last year after year! With these systems in stock, ready to ship with an order by 3:00 ET, an unconditional 30 day guarantee and backed up by our 5-Year Warranty, there’s no reason not to give one a try!